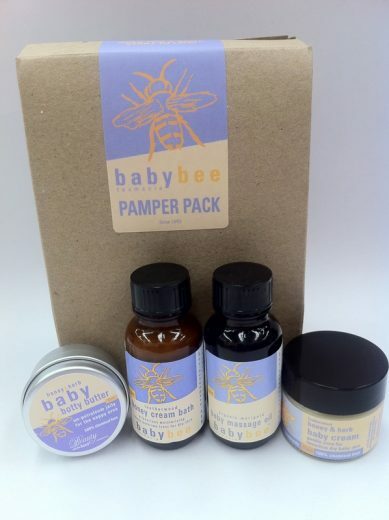 A sample pack so you and your baby can try each of our Baby Bee products. Also makes a great present for a new baby. Newly packaged in a natural satchel, Earth friendly! New picture to follow soon. Complete natural start care pack for all babies. A sample pack so you and your baby can try each of our Baby Bee products. Also makes a great present for a new baby. I was searching for a useful, different gift for an expectant mother and am so glad I found this. It is cutely packaged and I feel comfortable purchasing this as a baby gift since the products are all natural. It is such a great way to try all the different little products and to introduce someone to the fantastic items available here. A great way to try all the lovely baby products! 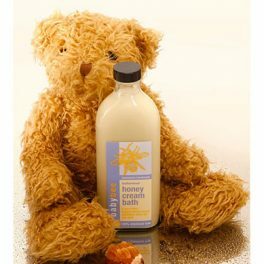 I never would have though I’d love the Baby Bee honey bee bath so much and probably never would have tried it without this sampler! Lovely idea and a great gift for new mums! It’s so comforting to know that you’re using 100%natural products on your baby. I bought a Baby Pamper Pack while on holiday in Tassie when I was pregnant. Best buy ever! The products are beautiful, I have been so pleased especially at how well the botty butter and honey and herb baby cream have cleared up every little rash and irritation, without the use of harsh chemicals. Am so jealous of the mums giving birth at Hobart’s Private Maternity Hospital! What a lovely way to pamper new mums, with some special treats for their bubs! Beautiful, quality products that are natural and gentle on your skin. Ordered Botty Butter and Baby Soap for a friend whose baby is due soon, I used it on my daughter as well, they are so gentle on baby’s skin. Postage is incredibly fast, ordered late on Sunday night, arrived early Tuesday morning. Postage cost is fairly high but this reflects how quickly and securely your order is received. It also ensures the products, which are natural and have a sort shelf life, arrive quickly. I love this stuff! I bought myself a pamper pack to take to hospital while pregnant with Baby number 3. I hadn’t tried the massage oil or the cream before. I first used up all the cream. Now I’ve finished the oil. The soap went ages ago and the botty butter resides always in my nappy bag. I bought a large bottle of the baby bath cream and after a day my husband dashed the bottle on our bathroom floor. I was so DEVASTATED have finally ordered some more. There has not been a single item in this pamper pack I had not used completely by 5 months and thats by trying hard to make it all last! Thank you for your great products and for being Tassie made makes it all the better! I recieved this pack whilst in hospital after the birth of my daughter. We have been using your products ever since and i simply LOVE them. The are so soft and gentle and Williw’s skin always looks and feels amazing. I was given a Baby Pamper Pack for me to try on my daughter’s eczema. I am very pleased happy to tell you that the cream has cleared it up! My little girl has suffered while I tried every other product (I wanted to avoid medication for it) and we have finally found something that works. I will be sure to recommend this to all of my friends whose bubs suffer the same problem.